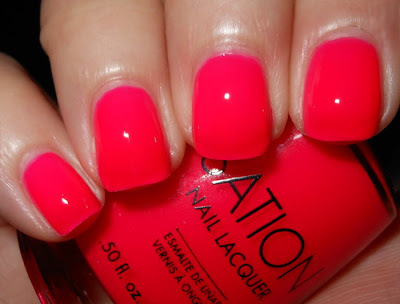 Let's be honest here, whenever I'd see Sation nail polish I would completely pass it up. It was a brand I remember seeing in the early 90's on nail polish racks in small little manicure places. Whenever I saw them recently, they seemed be in the same exact bottles from 20 years ago with the same range of colors. Recently, Sation revamped their image, and Sation is now on my radar. They sponsored our recent Central Florida Beauty Bloggers meetup, and I got to try this polish. Hail to the Pink is neon hot pink jelly. This is highlighter pink, and it's jelly! I know there are other colors like this out there, but let me tell you this is the best formula I've seen on a neon ever. This only took 3-4 coats. It applied smoothly, and without any streaks. The color is evenly distributed. I was really surprised! I'm so glad Sation revamped their brand. It was much needed, and it got my attention. You can see a lot more from Sation on Let Them Have Polish! 's blog. These polishes are available for purchase on Miss Professional Nail website for $5. My only complaint is I hope I can see these in stores sometime soon. I think with their new selection of colors and new image they really need to be showcased in stores. People need to see these in person! **This product was provided to me by Miss Professional Nail for my honest review. Pretty - it actually kindof looks like it has a gradient effect. Wowzer this is bright :) Looks great! So glad you liked it! This looks like an AWESOME shade! I love jelly finish neons! Sation is doing a fantastic job with this revamp! This is so bright and squishy! I love it! I love that it's a jelly. Looks great! Very pretty! They carry these at a nail supply store in town here. I just got Oh My Oceania and am in love. That one is gorgeous! I saw it on LTHP and had to have it! ok i am wiping my drool a bit..this is gorgeoussss! This is really pretty!! I'm hoping it becomes more easily accessible also. It's about time they changed their look, They are at a great price to try and I just think I might. Love this color. That shade is AWESOME on you!!!! I just ordered 6 polishes by them! The new shades look awesome! Beautiful and bright and your nails look pristine! Thanks for the follow on my blog, www.beautyprofessor.net! I just signed up to follow yours. Don't know this brand, but really like the bright pink! Gorgeous color! I have lots of their new colors on my blog. Wow, this amazing for summer. Love the color and the fact that it's a jelly. This is what I have been searching for. I will not rest until I have it. So mad, I passed on ordering it because I hadn't seen it swatched. Love my other "new" Sation's...can't wait to order!! Got Class Clawn oohh my What a great jelly green glitter!!! !